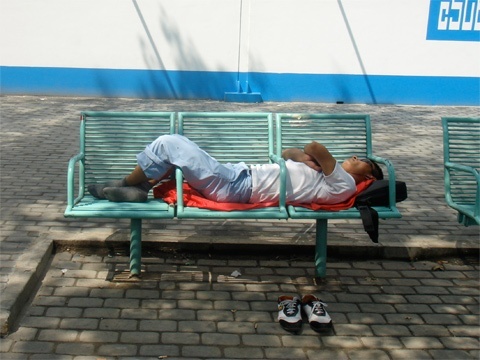 This man accomplishes the feat of sleeping on a bench designed not to sleep on it. It is a sign of the limited powers of control through design. Especially since the man is taking a nap next to the new CCTV building site. The public space that is planned around the building is said to be designed to have extensive surveillance. It fits the image of CCTV to create such a controlled environment. The man however looks fully comfortable living around any design meant to be an obstacle.